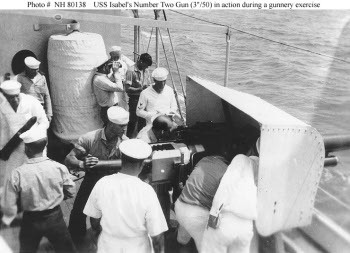 The 3"/50 was the first antiaircraft gun adopted by the U.S. Navy, and the standard type battleships completed from 1915 on were allocated a battery of four, and later eight, guns. These guns were obsolescent by 1941, but continued to be employed in large numbers on smaller or older warships and on submarines simply because they were available. They were produced in several models, but all were mounted in hand-driven semiautomatic mounts. Many were subsequently replaced with 5"/38s (if the platform was large enough) or various light automatic antiaircraft guns. A few of the older models had low-angle mounts and thus were not usable as antiaircraft guns.